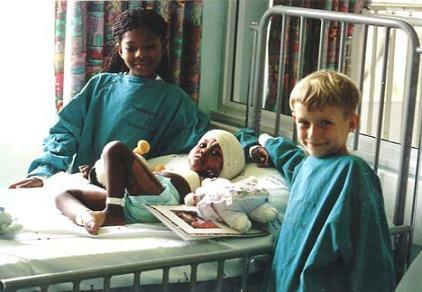 Visit to Baragwanath Hospital by Children of Fire on January 6th 1999 Tristan, Thobe, Thabang and Bronwen. 46km return trip. Gave each child a Tristan and Thobe book and, as there were less children in than we had expected, gave each one except Bafana, two soft toys. As he was older (and we hadn't been told before that he was there), we gave him a cap, a book and one little teddy. We also left soft toys and books for two new admissions. And gave matron herself a book. Sibusiso Matyeni, boy aged one. Pulled the cord from the kettle. Hot water burns. Gave him yello beanbag chick and little Christmas hat panda. Mbali Mdlani, girl aged two. Was caught in a shack fire in which her mother also died. Burning by open flames. Mother was at that time living with a boyfriend. Biological father not responsible (i.e. will not be responsible for his child). Mbali will be raised by her grandmother. Lot Shirinda, boy age 6. At rear, Tristan and Thobe near him. He was burned by an open flame on two legs and one arm. Gave him Nala (Lioness from the Lion King) and a big rabbit with a red ribbon on its head. Thapelo (means Prayer) Nemakanda, girl age 3. Sitting at front right of picture. Kept shaking her head at different toys offered. Eventually accepted little red-haired doll (?gift from Sizanani?) and brown teddy. Dhumisani Ndevu, boy aged 3. Between Thapelo and Lot. Hot water burns on his legs. Big white teddy and one other toy. Pauline Modupi, girl aged 7. Her father? or other relatives were burning old materials. A can of thinners was in the fire. It exploded and she was caught in the blast. Gave her Cabbage Patch doll and floral-trouser rabbit. Lungile Sibisi, girl aged 2. Burned by hot water. Cried a lot when we first came. Later liked touching/pulling Tristan and Thobe's hair. Gave her bright pink and bright orange lions. Jabulile Mugabi, girl of two-and-a-half. Bottom and leg burned by hot water. Yellow cartoon chic and . . .
Bafana - 12 year old boy terribly burned when one of his friends threw some wire taken out of old car tyres over electricity cables outside "in an area where we always play" he said so quietly that I strained to hear him. Bafana caught the wire and the shock went right through his right hand and arm, passing through his body so that three quarters of it was burned, and the electricity exited the boy through his backside. A chart ont the wall behind him showed the outline of the front and rear of a human being. It was shaded pink where he had been burned. Most of it was pink. Bafana was in the adult ward. Pretty depressing. The Matron was quite interesting. Said that the hospital had treated a case a bit like Dorah. Was suprised that she had been turned away.. she said. The special "Johnson & Johnson" paediatric burns unit was opened in 1995. (Dorah was burned in 1994). She also described a boy called Michael who had been treated for burns injuries and lost his lower legs (also electrical burns like Bafana) - and he's just sent the hospital a card (many years after the injury) to say how well he's just done in his school matric. Johnson & Johnson have helped produce some anti burns posters. There will be displayed in the hospital (bit like shutting the stable door after the horse has bolted, I commented) and in clinics (which is more worthwhile I reckon. But somehow I'm not sure they'll have enough or any effect - because the kids look happy in the cartoon images. I have asked for a set of them. But I think that pictures need to be more dramatic to make people think. I gave her a copy of the draft Schools Guide and of the first Times article. I asked for a set of the posters which she say's she'll ask Johnson & Johnson for.